This is the ultimate setup for the racetrack, camping, or just about anywhere. The folding double seat/cooler combos are made out of black, water-resistant 600 denier poly-canvas and features two Summit® logo chairs with an insulated cooler table and drink holders in the center. That means that there's always room for two people to sit down and that there are always cold drinks right at hand. Best of all, the whole thing folds up and slips into a carrying bag for total portability. Great chairs for the price and they are well built. Will definitely buy again. 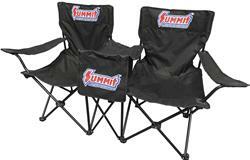 For two people seating at any race event in which you are participating this is a great buy for a compact set. It folds up for compact storage when not in use. Ideal for limited trailer space. We are very satisfied and will be ordering another. It is sturdy enough for the biggest crew chiefs to rest themselves after a race. Bought one of these last year as a door prize for our " new scouts pinewood derby race". I liked it enough I had to buy one for my wife and I to use at car shows. Bought to use at car shows. Like the added feature of the little cooler. Notes: Chair has a 600 lb. total weight limit. Handy and easy to transport. i bought this for sitting at car cruises but use it for more. I haven't used it yet but my wife loves it.